Since the 15th century, developments in printing and the increasing power of humanist thought had stimulated a culture of innovation and experimentation throughout European universities. This experimentation reached a ‘golden age’ in Oxford during the 1600s, where some groundbreaking medical and biomedical research was conducted. One early pioneer, Doctor William Harvey, settled in Oxford in 1642. In the early 1600s, Harvey was the first to accurately describe the human circulatory system. Looking beyond a Galenic tradition, which suggested that blood was able to move around the body through the expansion of the heart and the contraction of the arteries, Harvey proposed that that the heart was a muscle which propelled blood around the body in a continuous circuit. Illustration from De Mortu Cordis, courtesy of Wellcome Images. Over a period of ten years, he demonstrated his theories to his followers, and in 1628, published De Mortu Cordis (On the Motion of the Heart) at the Frankfurt Book Fair. It took years for his theory to be well-received, but Harvey prospered personally, becoming physician to King James I. He accompanied the King throughout the Civil War, following him to Oxford, where he became Warden of Merton College. He continued his research at the University, influencing a generation of medical practitioners in the process. 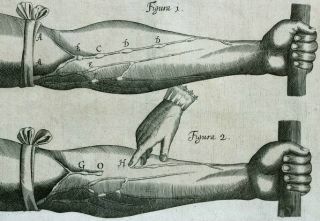 After the disruption of the English Civil War between 1642 and 1651, the University continued to produce remarkable physiological and anatomical research. Doctor Thomas Willis, the Sedlian Professor of Natural Philosophy from 1660, was the first researcher to understand the significance of ‘The Circle of Willis,’ the network of arteries at the base of the brain. In 1661, Willis and Richard Lower (his pupil and junior partner, who performed the first human blood transfusion in England) injected dye into the carotid artery (a major blood vessel in the neck) of a dog, and found that its entire brain was stained. They also tied off all but one of the arteries at the base of the dog’s brain, and it remained unaffected. Their experiments demonstrated the physiological importance of the Circle of Willis to blood circulation in the brain, and advanced Willis’ research into the anatomy of the brain and nervous system. Willis is regarded as the father of clinical neuroscience (indeed, he coined the word ‘neurologie’), for the work which he carried out at Oxford. Read more about the work of Thomas Willis. 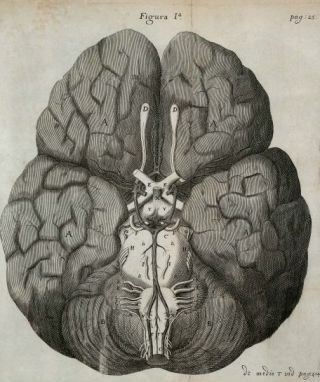 Illustration of the brain from Willis' Cerebi Anatome. Image courtesy of Wellcome Images. Modern understanding of the cell can also be traced back to the research of the polymath Robert Hooke, who studied at the University of Oxford in the 1650s. A pupil of Willis, Hooke developed a lifelong passion for science from his studies at the University. His interest in microscopes allowed him to demonstrate the cell structure of living tissue in his 1665 book Micrographia, and he was the first person to use the word ‘cell’ in a biological sense. His book was a bestseller, and his discovery laid the foundations for future generations of Oxford researchers. Medical teaching at Oxford also advanced during this period, largely thanks to the efforts of Doctor Thomas Clayton, the Regius Professor of Medicine between 1612 and 1647. Clayton obtained benefactions to establish the first physic garden in England (the Botanic Garden, which can still be visited today), founded an anatomy readership, and arranged for Bartholin’s Anatomy to be printed for the special use of the students. He also organised student apprenticeships to physicians in the town to learn the practical skills of a doctor, laying the foundations for clinical training at the University.